The second biggest Ebola outbreak in history is going on the in the Democratic Republic of Congo right now. It’s second only to the 2014 outbreak that infected nearly thirty thousand people and killed more than 11,000. So it’s not the time to panic. But it’s time to be watchful. This outbreak is also affecting a previously-unseen large number of infants. Local traditions and fears are making the spread more difficult to contain. Another major issue with the current outbreak is the lack of understanding of the virus from the locals. Many local traditions and fears are worsening the outbreak. For example, a group of young people broke into a morgue last week and stole the body of an Ebola victim so that the family could provide a traditional burial – which generally includes a “dance” with the corpse. This is horribly dangerous because the contagion remains after death. And that’s not all. People who are being treated in hospitals frequently make their escapes. Sometimes this is due to fear of the treatment, and other times it’s because the hospital itself is attacked in the ongoing violence in the DRC. This happened over the weekend when 24 patients fled a hospital that was under attack. 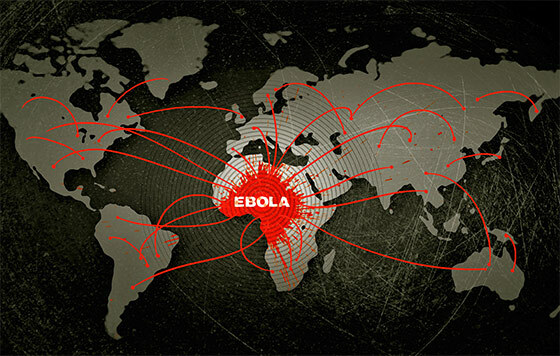 Really, it’s a perfect storm – and the world will be lucky if Ebola is contained. It really seems like it’s not a case of if it gets out…but when. But it isn’t just the gruesome visuals. The risk of death from Ebola can be anywhere between 50-90%, depending on the strain. This outbreak is the Zaire strain of Ebola, which is the same one that made it to America back in 2014. When American Patient Zero, Thomas Duncan, first showed up in a Texas emergency room, he wasn’t tested, despite the fact that he told them he was from Ebola-stricken Liberia. Proper practices were not followed, and one of the nurses who cared for him became the second victim. All sorts of near misses occurred, like the fact that the plane that carried an Ebola patient made FIVE trips before it was sanitized. The news came out this morning that the second American nurse diagnosed with Ebola flew on a plane with 132 other passengers from Cleveland, Ohio to Dallas, Texas. Amber Vinson had a low-grade fever when she boarded the plane, and was admitted to Texas Presbyterian Hospital just hours after disembarking. Not only were 132 people who flew with Vinson exposed to Ebola. That sounds like the plot of a cringe-y movie, where you watch the sneeze spray of an infected person in slow motion landing on everyone nearby. But that wasn’t the only mind-boggling thing that happened. But that wasn’t the only mind-boggling thing that happened. We brought some exposed people back to the US and put them in hotels. A couple of days ago an American healthcare worker who had been definitively diagnosed with Ebola was brought back to the US for treatment at the National Institute of Health (NIH) in Bethesda, Maryland. Eleven more patients have been isolated and are on their way to the United States as well, after having had “potential exposure” to the disease. Now, about those people who were “potentially exposed”? So, I think we can all agree, looking to the National Institute of Health, the CDC, and the WHO to keep us “safe” is not the best fall-back plan. We have to be prepared to take action ourselves should this outbreak turn into a pandemic. Don’t panic. Just pay attention. There is usually a little bit of warning before an outbreak becomes severe enough to warrant the title “pandemic.” It isn’t like The Walking Dead, where suddenly 80% of the population is affected overnight. With a pandemic, you hear a little hum about it before it gets bad. The World Health Organization makes some flyers, reports are given, and there is a mention on the evening news. But, generally speaking, officials are stingy with information because they don’t want to “start a panic.” This means that the judicious prepper needs to pay close attention when new viruses begin to be mentioned. Now, just because a virus is mentioned, it doesn’t mean that it’s going to become a pandemic, of course. However, it can be an early warning sign that you need to get your ducks in a row. Think of it like a tropical storm. You hear about it gathering steam out over the ocean well before it ever makes landfall. Just because there is a storm somewhere in the Atlantic, it doesn’t mean that it’s going to hit, but it means that the wise person begins to pay closer attention to the weather reports, makes certain that the basics are stockpiled, and puts together a plan just in case the time to board up the windows arrives. Avoiding contact with people who have the illness is the only way to prevent getting it. Should an outbreak occur, isolating yourselves is the best way to stay safe and healthy. This is the tricky part: How do you know that the time has come to get the family inside and lock the doors behind you? Lizzie Bennett, a retired medical professional, wrote an incredibly helpful article over on her website Underground Medic during the initial outbreak. Bennett recommends social distancing as the only effective way to protect yourself and your family from an outbreak of disease. This Ebola thing could go bad in a hurry. And by bad I mean that the last time around, it killed well over half of the people who contracted it in West Africa. Now is the time to plan with your preparedness group how you intend to handle the situation. Will you shelter together, in the same location, and reserve a secondary location to retreat to if the situation worsens further or if someone becomes ill? Will you shelter separately because of the nature of the emergency? Decide together on what event and proximity will trigger you to go into lockdown mode. Make your plan and stick to it, regardless of pressure from those who think you are over-reacting, the schools that your children have stopped attending, and any other external influences. If you’ve decided that there is a great enough risk that you need to go into lockdown, you must adhere to your plan. Note – we do not commonly use anti-bacterial products but in a situation like this, it’s important to have this type of thing on hand in the event that there are issues with sanitation. Download the Pandemic Prepping Shopping List here. See the links above for specific product recommendations.